From the star writer and illustrator team of the Mango & Bambang series comes a funny, heartwarming picture book all about choosing the right dog. It can be a pickle to pick the right dog. Take a guided tour of the dogs' home with one characterful canine - he's been there the longest and knows everyone, so he'll make sure you bring home the perfect companion. Will it be hungry Harvey, who eats everything? Or clever Dumpling, who can chew through the crossword in record time? Or sporty Boo-Boo, as bouncy as a ball? How about Poochy Petunia Wuffles-Winstanley, the poshest pet in the pound? Oh it's so hard to choose. What a pickle! 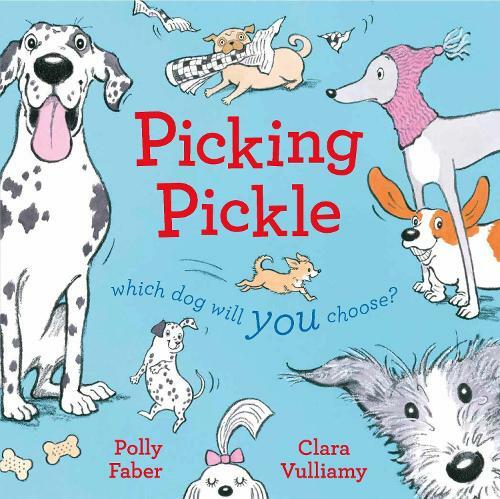 With gorgeous illustrations from Clara Vulliamy, and laugh-out-loud text from Polly Faber, this book is guaranteed to be your favourite, whichever dog you choose!